Tied by Bob VanAmburg four our second fly swap. This fly is very simple, so simple that I was reluctant to offer it as part of a swap, but did so because it has so many great memories and is an excellent example of design evolution. The standard Adams has always been my favorite dry fly, and has been since I began fly fishing and tying in 1969. When I moved to the interior of Alaska in 1977, I discovered that our resident grayling didn't like it much; it would catch a few fish, but didn't perform very well. Despite what you might read in magazines, grayling aren't the slightest bit selective; they'll take any fly as long as it floats high and is black. The second qualification seems to be nonnegotiable. TAIL: Several (4-8) moose main hairs, tied slightly longer than standard. Avoid including too many white ones. BODY: Black Fly-rite, dubbed rather tightly, taped from front to rear. HACKLE: Grizzly over black, slightly longer than standard. I had been tying the Adams with moose mane tails because they are much more durable than with the standard hackle fiber tails. It was a simple step to change the body from gray to black. Later on, I dropped the brown hackle in favor of black. 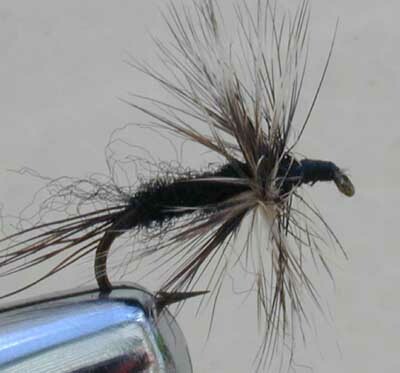 I found that the hackle tip wings didn't really add anything to the fish catching abilities of the fly and tended to be a little fragile, so they were initially changed to gray poly and still later dropped all together. I still have several flies from those days that were retired after catching 100 fish in a single day. During July and August, the grayling in the Chena and Chatanika Rivers were incredibly abundant and easy to catch. They're not large, at 10-16 inches, but were a lot of fun. My high light of fishing this fly came in 1979, when a friend and I successfully completed a caribou-dall sheep hunt in near Mt Drum and had a few days to kill hanging around the pickup lake. I was catching grayling for dinner, and a 9 pound lake trout rose to the fly. The thrill of catching that fish was the high point of the trip, despite having taken a good caribou and a Boone and Crockett class cheep, and convinced me that I really needed to concentrate more on fishing and less on hunting. I later had success with this version of the fly in the southern Appalachians, the rocky mountain west, and in Washington State.